Hello everyone! My name is Jess and I work with Kati at FineStationery.com. In her absence she asked me to collaborate with Rebecca of Tastefully Entertaining to provide you with some eye candy over the next two days. In tribute to the warm glow of autumnal light, Rebecca and I decided to create an inspiration board full of golden hues combined with the cozy comforts of cream. 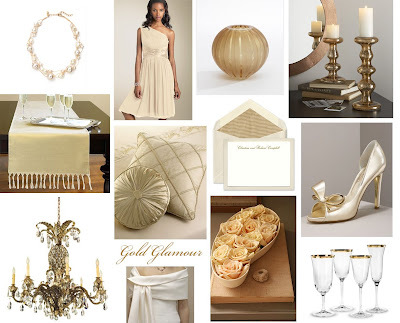 Gold has always been a symbol of glamour, but when complemented by winter whites and blanched ivories, it radiates a feminine elegance that is both romantic and sophisticated.